Railpictures.ca - Tim Stevens Photo: CN ES44DC 2291 leads M310′s train onto the north track at Devona. The spectacular sunsets and high winds blowing sand all over the place makes for a dramatic image. | Railpictures.ca – Canadian Railway Photography – photographie ferroviaire Canadienne. Caption: CN ES44DC 2291 leads M310's train onto the north track at Devona. The spectacular sunsets and high winds blowing sand all over the place makes for a dramatic image. Amazing shot, beautiful. The caption says “sand” being blown around. I would have thought it was snow. Yes, this is a terrific shot. Only thing missing is wildlife – a bear, or deer, or something. 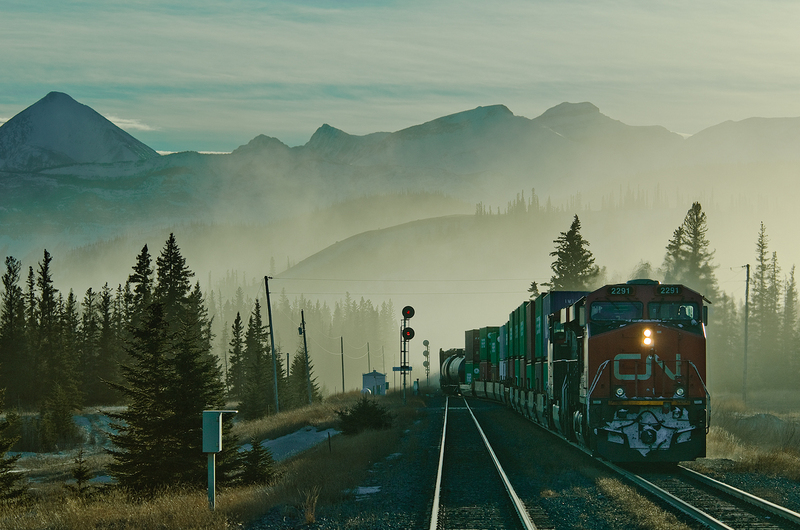 Shot from the cab of my CN High Rail truck, 30 miles west of Hinton. Cheers. And you were aboard train ? Pretty scene, Tim. Wonderful light.